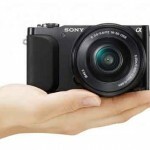 Sony will launch the NEX camera line with three available lenses. Which lenses should you choose? Sony has announced their new Nex-5 and Nex-3 interchangeable lens cameras. Here’s how the EVIL cameras stack up.